There was melon at the Labour Party think-in. But - for a change - not too much melancholy. Just inside the door of the Glenview Hotel in Glen of the Downs was an elaborate tableau to greet members of the parliamentary party as they arrived for their two-day collective cogitation. There was a Labour Party logo (complete with big red rose) fashioned from a large slab of cake-icing, flanked by two melon sculptures, which also featured the Labour Party red rose. And behind the icing logo stood a figurine made of chocolate, which looked eerily like Fianna Fáil's Willie O'Dea. But assurances were given that the presence of a chocolate Willie was simply coincidence, rather than a confectionery hint about a new electoral pact strategy being planned by the junior coalition party. And whether the Coalition likes it or not, it's all about elections from here on in, no matter how many times the Taoiseach goes blue in the face from insisting that he has no intention of bothering Michael D at home any time this year. But until that day dawns, Labour is up atop the high-wire with a tricky balancing act to execute in persuading the electorate to vote for it again, given that many voters are still beady-eyed over a plethora of promises made by Labour the last time out, which subsequently bit the dust. So the contortionist's trick ahead of Joan Burton is how to woo people to vote for Labour by promising good stuff - but nothing specific, mind. There will be no hostages to fortune (or ill-fortune) during the next campaign. No pledges not to lay a finger on child benefit and the like. But what about the big issues close to Labour's red heart, such as a referendum on the repeal of the Eighth Amendment? After all, the Taoiseach shut the door with a resounding clang on that one. The Labour leader was cagier than the lion house in Dublin Zoo. Nobody was putting Joanie in the corner. "I personally never use terms like 'red line'. I go into negotiations," insisted the Tánaiste before proceedings kicked off. "We will have a very ambitious manifesto based around recovery, renewal and around reform," she declared in what sounded suspiciously like a nice vague election soundbite. Even when the session went behind closed doors, very little skin and hair flew over this proposal. Meath East TD Dominic Hannigan, who had already expressed his public dismay over the pact, was absent from the think-in and the only dissenter in the room was Dublin Central's Joe Costello. However, Joe's ruffled feathers were smoothed somewhat when he was given assurances that while the pact would be in place, it wouldn't be mentioned in any election leaflets or posters. But despite the rain hammering down outside the hotel and despite Labour's determination to rain on the parade of Budget and election expectations, the party was wearing a slightly more sunny aspect. With a recovery under way, the party fervently hopes that a rising economic tide will also lift a badly holed Labour boat. An opinion poll at the weekend gave the battered crew some hope that they won't all be dashed against the election rocks. The venue was in the home turf of local TD Anne Ferris, now happily returned to the Labour fold after a spell outside it. 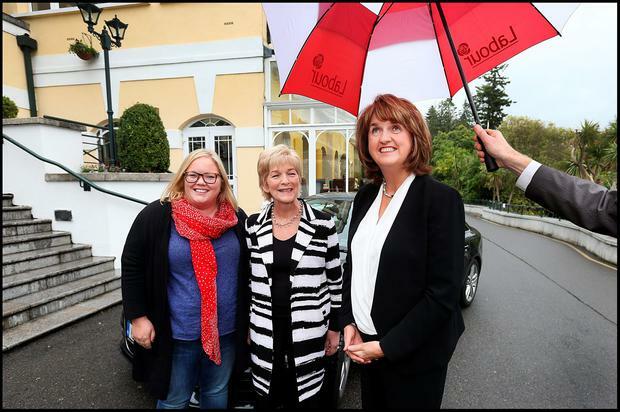 She and the other women TDs and senators smilingly posed together in the rain - a sly dig to an almost entirely female-free Fianna Fáil party which was also holding its think-in yesterday. Even the trio of retiring former leaders were causing no trouble; Ruairí Quinn, Pat Rabbitte and Eamon Gilmore all stood philosophically at the back of the group for the family photo. The party's chairman Jack Wall delivered a fiery Braveheart-style oration. "Let's be clear, there would have been no referendum, no marriage equality, no party in the Panti Bar if it was not for Eamon Gilmore and this Labour Party," he declared to a round of applause. "Now is not the time to flinch or baulk. Now is the time to dig in, dig deep and believe in ourselves." There was the unmistakable whiff of an election in the Wicklow air. The Tánaiste was adamant that Labour's election manifesto would be ready "within days" if Enda pulls a fast one and that the party would return to government. "Let there be no doubt, we're going to do it. We have to do it," she declared. During the closed session on election preparations, Brendan Howlin urged his colleagues to be proud of the party's achievements in government and to take no guff from the opposition. "We put out the fire, and by Christ, we shouldn't accept being lectured to by the pyromaniacs," he demanded. But Pat Rabbitte still likes to keep his teeth sharpened. Former Tipperary senior hurling bainisteoir Liam Sheedy delivered a rousing motivational speech, which was followed by a question and answer session. Pat took aim: "Is there anything we can do to build Alan's self-confidence?" he asked innocently. Joan Burton can rest easy - building Minister Kelly's self-esteem is one thing she's no need to add to her to-do list.